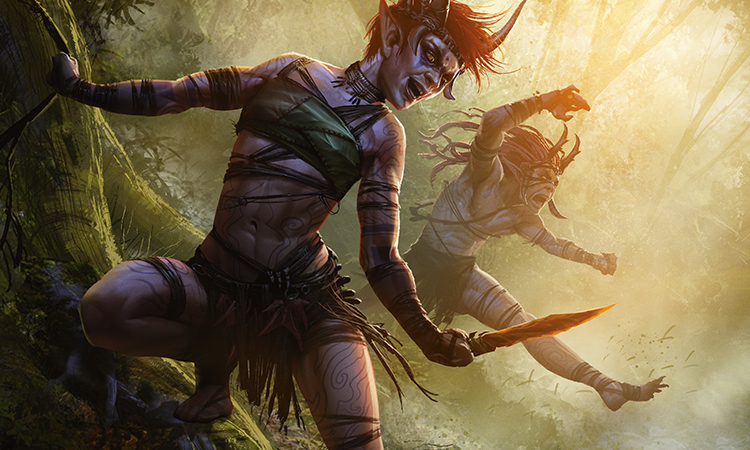 The elves of Zendikar have spent generations adapting to the plane's ever-changing environment. 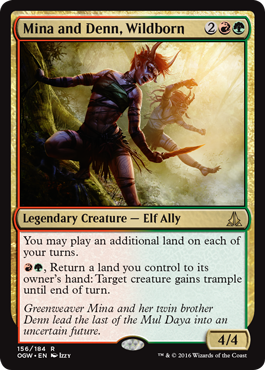 Resilient and fearless against the destruction of the Roil and the Eldrazi, their close-knit villages seemed to regrow with the speed of the jungles themselves. But with the coming of the Eldrazi, two of the three great elf nations—the Mul Daya and the Joraga—were nearly eliminated. For the Mul Daya, a group steeped in tradition and familial ties, survivors were torn between either staying to die with their village Speakers in the devastated remains of their land or venturing far away to seek assistance. Greenweaver Mina and her brother Denn are two lone refugees who have traveled an entire continent away to Murasa in search of aid and the means to reclaim their fallen home. Days, weeks had passed traveling through the Blight. The humid, heavy breath of the ancient Guum forests gave way to a desiccated whisper of plains laid bare by skittering feet. Mina had kept careful watch over the passages of the sun, bearing steadily toward a location she had only ever heard of in reluctant murmurs or vague accounts. Close now, close. She reassured herself. The dust from the Blight covered her clothes and coated her bare feet. The tough, ossified ground left patterned imprints on soles more closely accustomed to the dense mosses of her lost homeland. Resolute, but footsore, she reached the ravine that formed the outskirts of the Murasan forests. Or what had once been the forests. The Blight was a blinding pure white and rose in twisted spires that had once been trees, animals, rocks. The sheer cliffs were immaculately blank, silence reverberating through the valley. The silence weighed heavily on her—since her childhood she had been surrounded by the sounds of her land, her elders, her family. Whispers, yells, commands, pleas...their sounds had always tethered her to something, someone. Here she was a lone piece of color and noise, an affront to the blankness around her. She kicked at the ground absently, and a cloud of white dust obediently wafted up and fell back down in ashen flakes. Like snow without winter, she mused. The blankness filled her vision and her ears with the dull-ringing white noise of senses desperate for purpose. She turned slowly, her keen red eyes scanning the horizon for signs of color, sound, life. The blank cliff faces leered back at her. So the Blight had reached all the way here as well. Ancestors, she mentally swore. Denn will not be pleased. She had been convinced they could find the Tajuru Grove here, and the two had parted ways at midday to cover more ground in their search. Mina's fists clenched around her long knife, the familiar wooden handle and heft of it settling pleasantly into place. A surge of familiar bitterness rose in her chest, savage and warm, rattling against her ribs. She let out a long, ragged tone that reverberated back at her from the ravine below. She smiled, satisfied with any way to break the oppressive silence. From the other end of the ravine, something stirred. A shape twice Mina's size scuttled forward into the light, the tapping of bony appendages against the rigid surface of the blighted ground. Her breath caught in her chest—the creature couldn't have wandered too far from its feeding ground, perhaps there was new ground yet? It turned towards her with a dull hiss. Excellent, it had seen her. Mina grinned, baring a mouthful of pointed teeth. She hastened down into the ravine, leaving a cloud of dust and shattered Blight with the graceless enthusiasm of a baloth pup. Reaching the floor of the ravine, she barreled towards the creature, unsheathing her knife from her belt as she lunged forward in a fluid reflexive motion. The thing paused, eyeless face throwing forth feelers in her direction, pseudopods blooming from its skin and bristling along its radial crests. A keening sound emitted from the crest of its body, perhaps in some harmony with commands Mina could not hear. She dove beneath its primary mass, gripping pseudopods in one hand and finding flesh with the other, the engraved blade of her knife gliding with satisfying ease, carving paths into the creature's underside. Blood pounded in Mina's temples; the flesh of its back was rubbery and unexpectedly cool to the touch. A cut that would have spilled the guts of any ordinary beast instead produced a meager drip of acrid gray fluid. Not an unfamiliar outcome for their kind. She welcomed the chance to express her gratitude for her dusty, footsore state with a messier approach. Dodging the whip of a sinuous limb, she grabbed it as it passed and clambered up its length—they were sturdy as any root or branch, which she was well equipped to handle. On its back, she gripped behind its bony head-plate, piercing beneath it with her knife and twisting it with relish. The thing immediately collapsed beneath her, limbs twitching. Mina leapt off its back and stood back, waited for it to rise. It stayed on the ground, phantom nerves helplessly pulling at severed limbs. Mina reached down for its head and pulled it up towards her, staring into its vacant face. What were you seeking here? Why do you stay? The mask stared back, impassive. There was no emotion to read on it, no panic in death, no begging or bargaining, no pity. The elves had always been a resilient people, weathering the roiling landscape as it shifted and changed. They coexisted with the Roil's inconsistencies, left their dead in shallow graves under the protective grasp of the jaddi roots. The elders had thought the tide of Eldrazi would, like the Roil, force them to adapt and change. Instead, they drowned. The creature's flailing slowed and stopped. Mina dropped it to the ground with a dull thud. From the shadows of the ravine, two new humanoid figures emerged, one of them very familiar. Like Mina, her twin brother Denn was unarmored, barefoot, visibly unarmed save for their long knives carved from the poisonous woods of the Guum. In place of armor, vine-like markings snaked over both of their arms, messages bearing the words and lineage of their kin—dead, living, unborn—their murmurs crystallized onto skin. When the two left Bala Ged, they took with them the bones of their fallen that now adorned their dark red hair. Behind Denn stood a slight, hooded woman clad in leather armor from pauldrons to stirruped boots. Unmarked and solemn, she led her mount behind her. There was no mistaking the sturdy construction and expert workmanship of her armor—a sentry of the Tajuru elf nation. Mina scrambled to meet the pair, bowing her head to the Tajuru, eager to converse with the elf. But Denn had already noticed the pulp of the Eldrazi corpse behind her, and regarded her sternly. "Did you know they'd already passed this far into Murasa?" Denn asked Mina with forced slowness, his voice cracking with rising panic. "We're close. This was where they'd told us!" Mina flashed him a reckless smile that she hoped would mask her doubt. "That was weeks ago now! Has there still been nothing since?" Denn's face was stubbornly solemn—he'd learned the true meanings of Mina's expressions many times over. Mina stared at him, wishing she had words to say to him. The silence hung between them, a rift, wedging the twins apart. Denn looked away first. "Our Speaker had never said anything about this." It was Mina's turn to look down, hands clenching helplessly into fists. "More than far enough, to be certain," the stranger answered from behind him in lilting Tajuru tones before Mina could respond. "I've been sent to warn travelers away from this place, and found you two on my patrol." She paused, looking them over. "I am Warden Tenru, one of the many guardians of these Tajuru lands. It seems you've both strayed far from your village...?" she said, raising an eyebrow. Mina wiped her knife on the fallen Eldrazi and swept its dead flesh from her arms. "We are Mul Daya." "'We'?" Tenru asked, peering behind Mina into the emptiness of the ravine. "Are you scouts? Where are the others?" Mina sighed inwardly. Words had never come easily to her. Her head was always so full of sound and instinct that the words would bubble up and trip over themselves instead of leaving her mouth. Others would just tumble out before she could give them form and meaning. But this, this was important, and she had practiced this speech for weeks during their travels. "Months ago, we Mul Daya had stayed in our homes in Guum, reassured by our Speaker that our Ancestors insisted we stand our ground. The scions arrived first, and the defenses led by our vine ghosts beat them back." She nodded toward Denn, whose sullen silence gave no sign of acknowledgement. "But as the scions gave rise to their full-grown kin, the ranks of the vine ghosts thinned and our borders shrank so close as to touch the edges of the shallow graves of the elders." She paused, remembering their eyes staring up at her from their loamy beds, recalled how she had dreamt of their dreams. It was their essence, their memories, generations of history that had been processed into dust along with the groves they dwelled in. "Droves of us fell in defense of our homes. Our speaker fell ill and the voices of our Ancestors were silenced." she continued. Mina felt strangely detached from herself, listening to her own voice. Her own words sounded hollow and formal, with none of the visceral weight of the shame, pride, frustration from that time. "The Eldrazi arrived, conquered, fed, and left." She felt the slightest quaver enter her voice and stopped for a second to breathe in slowly. "I had...a vision as I slept near our dead. A vision of the destruction of Bala Ged. I took my brother during the night to seek audience from the Elven Nations. To ask them for aid, guidance." "And you?" Tenru asked gently. "What are you called?" "My name is Mina, Greenweaver of the Mul Daya." She rolled up her right sleeve to reveal the rank's insignia, carved deeply in wine-red ink on her forearm. Mina saw Tenru size up what she was sure appeared to be a matted, dusty, inexperienced mess in front of her. Tenru raised a doubting eyebrow, but nodded politely. "The conclave isn't located in any one place, but shifted with the incoming tides of Eldrazi," Tenru said. "Our motions are now a strategic network of planning and scouting, keeping close to what remained of the world they knew, careful of being encircled like...like our sisters". "I've patrolled the borderlands, bringing word of the Blight's spread back to the conclave," Tenru continued. "Their newest wave struck suddenly two nights ago, in greater numbers than we'd anticipated. We took our homes and retreated back toward the heart of the Grove—"
"The Grove still stands?" Mina bolted upright, eyes shining. "Please—take us there?" The jaddi grove jutted up from midst of the valley, splitting through earth and slowly dissolving slabs of rock beneath the unyielding grip of its roots. A dense canopy of perennially green leaves reached up into the cloud line where the humidity was densest. Spiraling patterns of leaves, each the length of an elf, festooned its many offshoots. In quieter times, the hollowed interiors of fallen trees had served as permanent homes. While the Mul Daya had made their homes amongst its roots, the Tajuru had become accustomed to the upper reaches of the branches, hidden from the view of the land-bound Eldrazi. This adaptation had kept them safe for years, until new waves of monsters arrived from the air itself. The three stood atop the ridge, staring down at the Grove. As the clouds shifted, sunlight fell over the valley. Mina heard Tenru inhale sharply, breath catching in her lungs. The ground here was completely unlike the pale nothing of the ravine. In its place, a dazzling array of vibrant colors refracted from the sharp facets of the rock. 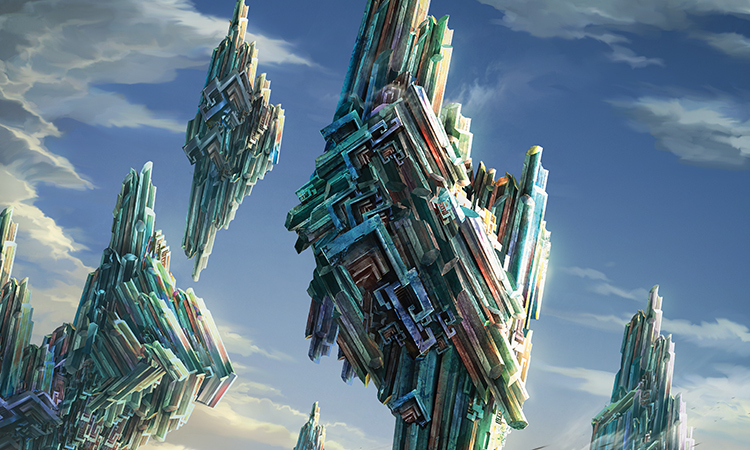 Some formations had crystallized vertically, in a twisted mockery of the trees that had once stood in their place. A thick, oily sheen oozed out from the multifaceted surface like an open wound, forming a slick coat on the remains of the undergrowth. "What...is that?" Mina breathed. From the corner of her eye, she saw Denn shake his head in horrified awe. Below the encampment, a group of Eldrazi had gathered, proboscises grasping onto its roots. One had scaled to the first offshoot, dislodging the tents of the settlement from their high perches and tumbling them to the forest floor. Residents of the encampment had retreated to their homes in the highest branches. Denn faced Mina, his face pale and drawn. "When we stood before the Speaker, I valued our blood over my word. I followed you when no others would, an entire continent away. I was ready to join the rest of our kin in the ground, our ground. And here, we've come so far, haven't we? From one plagued village to watching this one wither and perish...an entire world away". Tenru's face darkened at his words. "Watch your tone, Mul Daya—this is my home. I grieve for your loss, but never asked your help. We have no intention of succumbing to your same fate." 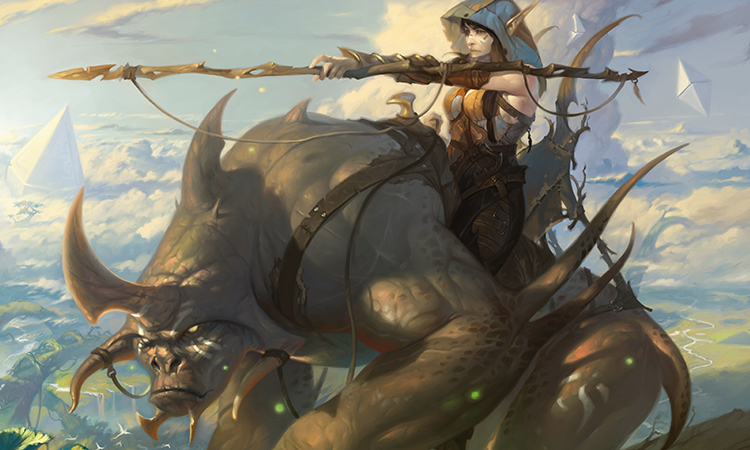 Mina tore through the valley, sliding over the slick, flat surfaces toward the Eldrazi as they gathered to feed. Like their brethren on Bala Ged, these too had deadly clusters of limbs and mouths. They pulled their pale masses up through the boughs on powerful forelimbs to draw sustenance from the trees and ground. But instead of bony plating, their bodies were insectoid and full of impossible symmetries. Above their heads sat crowns of delicate plating of a polished black stone so dark it seemed to both absorb and reflect light. Her knife still fouled with the fibrous gristle of the spawn from the ravine, Mina rushed at her closest foe. 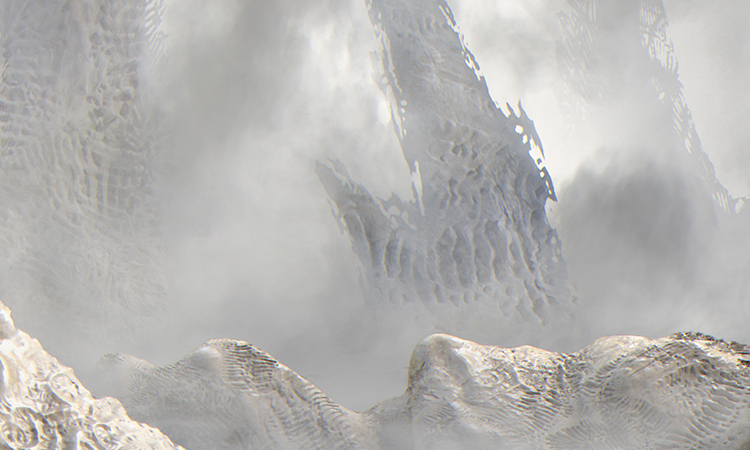 A sinuous hulking thing, its bulk was bloated from feeding and strained against the shell of its exoskeleton. Its smooth plates were the same depthless black as its crowned head, all angles and symmetry with no space for pity. Its many legs were crusted with eyes that glowed with unblinking, gemlike shapes. She swung the knife forward, slinging all her strength and momentum with it, aiming to spill open whatever innards the creature might hold. 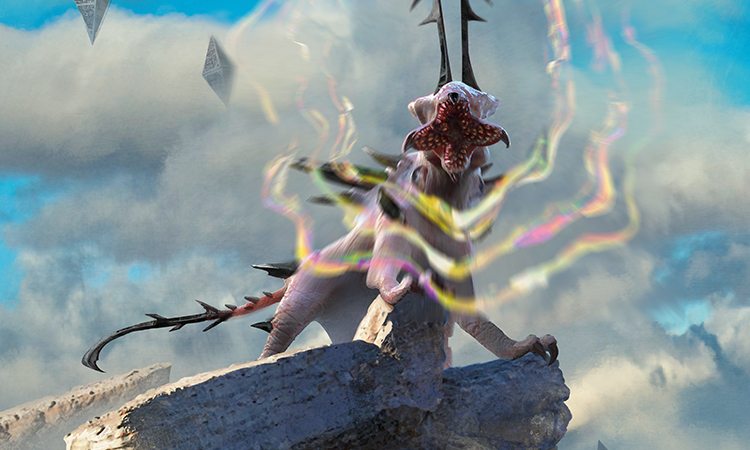 The weapon reverberated with the unexpected impact to the Eldrazi's outer mass, sending shockwaves down her arm and through to her teeth. She reeled, her numbed fingers dropping the knife. Behind her, she heard Denn scream and run toward her. A dull, oddly familiar sound filled her ears. Was it jangled nerves? The force of the impact? ...into the four slavering jaws of a black-crowned Eldrazi. She flinched away instinctively, but it was too late. She clenched her eyes shut. It screamed. Or she thought it did. A shrill chorus of tones, barely audible to her brain, vibrated through her skull. She felt something warm in her right ear. Pain bloomed along her body, matching the waves of vibrations that racked her frame. Blind panic seized her, and she scrambled backward on all fours like a hunted animal. Out of the corner of her eye, she saw Denn reaching out to her and whirled toward him. The monster turned toward them, abdomen distended with air, and wailed. The colors on the edge of Mina's vision blurred. In front of her, Denn's form collapsed and reformed in waves, the red of his hair and eyes draining from his body and bleeding into the edges of her vision. His outstretched arm was deflected in the opposite direction, bending at an impossible angle. His mouth opened and the words drifted helplessly from his mouth, his tongue unable to form their sounds, the air passing uselessly through his lungs. They hung in the air, meaningless and small, and dissipated. Mina thrust her arm forward toward his and felt her muscles sag uselessly, her bones flowing like viscous smoke through the air, impossibly slowly. Her fingers drifted apart, their tendons unwinding from the bone, veins distending and tangling. Even the ground beneath her turned to viscous liquid, sagging and flowing beneath her weight. Her legs were impossibly heavy, pulling her down and away from her outstretched arm. Her other arm found the hilt of her knife, and struggled to hold it as she unwound. Instinct propelled the blade from her hand, travelling outside the path of the monster's wail, striking it in one of its many gemlike eyes. Its wailing stopped for a moment, and Mina's body collapsed like a rag doll. The impact sent her crashing through the weakened Blight below her. When she opened her eyes, she found herself in a shallow depression, wind knocked out of her, head pounding. The light of day filtered down from above her, and she could see the underside of the thin, brittle layer of Blight that she had fallen through, the way a layer of ice covers the waters of a winter pond. The dull, familiar rhythm had returned. It was louder now. She struggled to find the thread of sound below the rumble of the beasts above her. It rose and fell like a breath, or was it...a voice? She tried to form patterns from it, shape the frequencies into meaning. From what felt like miles above her, the sounds of Denn's voice filtered into her waning consciousness. She crouched in the darkness, hands on the ground to steady herself. The sounds in her head were whispers. They were the voices she had heard in Bala Ged, of her elders, her jaddi. Her family. They melded together into something familiar. What was it they were saying? Her brow furrowed, hands clenching involuntarily around something...familiar. The ground under her hand was not the hard surface of the Blight. It was land, the thick, fragrant soils of her youth. Time's inexorable wheels stopped for her, suspended in a synesthetic bubble of collective memories. The smell of that same patch of soil baked by summer, boot-trodden, stained by blood or green with new spring growth, filled her lungs. She watched it with eyes that were not hers. The sounds rushed into her head again. "Mina!" Her brother's voice cut through her reverie, breaking her concentration. A hand blotted out the light over Mina's head, and she felt herself lifted up and out of the ground in her brother's arms. She could smell the blood on them, though she knew not whose it was. A whooshing sound passed just over their heads, and the ground behind them swelled and burst before their eyes. The impact of the errant wail left a cratered trail in its wake. "Denn! They're here! The Ancestors are still with us! There's land under the Blight here!" "Mina? Slow down, you're bleeding, we need to move—"
Mina reached up and cradled her brother's head as the next wail hurtled straight towards them, and dropped the handful of soil. The particles exploded into life, each expanding into a wall of thick stems, roots, and earth that shook as the wave of sound struck it, the outlines of its impact forming a kaleidoscopic stain in its center. The sounds in Mina's head were deafening now. Multilayered and toned, it blended choruses of voices and noises of all pitches, frequencies, volumes. A calm settled over her. She took a deep breath, cupped her hand over Denn's ear, and they all rushed from her lips like a ruptured dam. Some words were angry, tender, sullen, a secret language shared with a sibling whose voice she felt as her own. Some tumbled out in rumbling reprimand, stern warnings she had heard long ago. Others were a language and a tone that she felt but did not know, the warm gusts of wind in summer, the dull ache of regret. It was the sound of memories congealed in time and space. A calm settled over Mina, and she wove her words around Denn's wounded flesh and hands. His eyes widened, surprise washing away any attempts at feigned callousness. "Are these the Ancestors' voices? Where did you learn to speak in their voices? What do they tell you?" Mina only nodded, and said nothing. Another wail shattered the vine wall, the packed earth and thick curling stems falling into brittle, coruscating pieces. Mina turned slowly to face the creature, arms outstretched, and began to speak. In one sound, she spoke of her childhood home in the steaming jungles of the Guum, crouched in the undergrowth, listening to the rain. Pillars of wet earth and rock erupted from the ground, sending great jagged cracks racing across the surface like lightning over the facets of the Blight, tumbling the monsters from its face. The Eldrazi bellowed and stumbled to regain their footing. In the next she told stories she had never known, but that she knew were true. Stories of bravery and sacrifice. She pulled her second knife from its place at her hip. It was warm and smelled of damp leaves. She inhaled deeply and grinned to herself with savage zeal. This time, her cut slid easily through the carapace, her other hand plunging into the opened shell and ripping out whatever she could find underneath. Armored in cold obstinacy, she carved her knife in lazy circles through its pale body, spilling out pools of its essence. Behind her, something brushed past her shoulder as Denn felled another of the monsters, its body crashing to the ground as he severed its insectile legs. His laughter settled and froze for a second as she grasped and crystallized it into memory. It had been a long time since last she had heard it. She reached the roots of the jaddi. The crowned ones had spotted her now, reeking of power and new life, and raced down from the boughs towards her like arrows to their quarry. They pooled around her in a frenzy of clicking feet and open jaws. Mina saw the top of Denn's head disappear in the crush of crowned beasts. A deep rumbling radiated outward from beneath her feet. Thick roots tore through the ground, enveloping the armored bodies of the Eldrazi and pulling them in through the cracks in the earth. Boughs of the jaddi snaked forward and pulled the rest into the body of the tree itself, encasing them in bark. The surface of the valley splintered into scintillating plates of Blight, then sank into the soft new earth that surged from below Mina and Denn's feet. Tenru arrived soon after, joined by a group of a dozen heavily armed Tajuru and their mounts. Behind their ranks stood a fair-haired elf, smaller in stature but with a calm and gravitas that most often accompanied age. Her leather armor was intricately engraved, though harshly weathered by years of use. They hunkered in close to Mina, who had collapsed with her back propped up against the tree roots, cleaning her wounds. "So you are our kin from across the water?" the fair-haired elf asked. She picked up Mina's fallen knife, nearly hidden beneath the shattered layer of Blight, and handed her the hilt. "My pardon," Tenru interjected, "these are Greenweaver Mina and her brother Denn. Ghost vines of the Mul Daya". The fair-haired elf smiled kindly and bowed her head. "We welcome you as all our elven kind. Let distance and generations not separate us. What news do you bring from your kin?" Mina bowed her head in return, steeling herself to speak, though the words came easily this time. "I've come in search of Nisede, leader of the Tajuru, with the request that she accept aid from us, the...survivors of Bala Ged." "I am Nisede. What of your Speaker? Has he sent you in his place?" Mina's cheeks burned. As she started to speak, Denn gently interrupted. "We...are unsure. But I know that Mina, too, can speak with the voices of our kin. I've heard it. I—we ask to join you, that we can hold the memories of the Mul Daya safe." Nisede's face turned grave and her speech became slow and thoughtful. "My elves will continue to adapt and move, as we always have. We have heard word of a Zendikari encampment, near the Halimar Basin. An alliance of kor, human, and merfolk has arisen to make our stand or fall trying. I cannot promise you a safe place for your histories, but I can promise that we can deliver you to give your strength and your stories to the strongest place we know of." "Today we march to join them. Our leader is called 'Tazri,' a human from a city set on the coast of the Halimar. The city of Sea Gate."